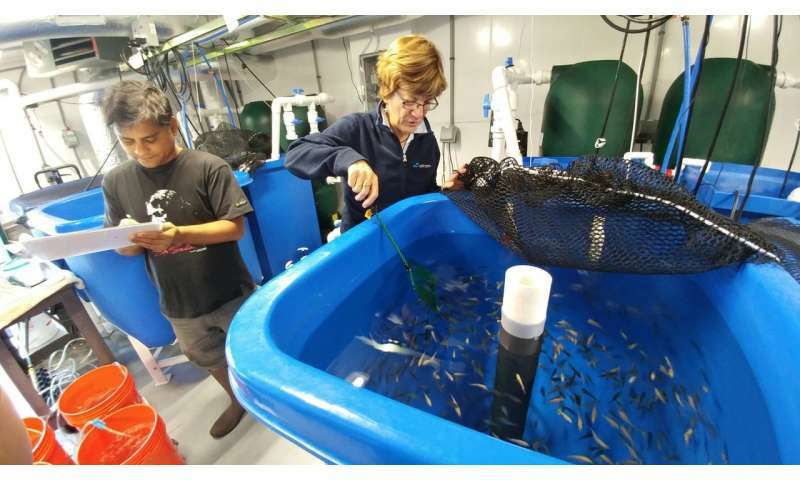 Dartmouth researchers Pallab Sarker and Anne Kapuscinski, who is now at UC Santa Cruz, conducting sustainable aquaculture research with Nile tilapia. Credit: Devin S. Fitzgerald. Aquaculture is the world's fastest growing food sector, surpassing the global capture fisheries production in 2014. It provides more than 50 percent of the food supply to humans; however, it poses several environmental concerns. Aquaculture feed (aquafeeds) draws on 70 percent of the world's fishmeal and fish oil, which is obtained from small, ocean-caught fish such as anchovies, sardines, herring, menhaden, and mackerel¬, that are essential to the lower end of the marine food chain. Analysts project that by 2040, the demand for fishmeal and fish oil will exceed supply. 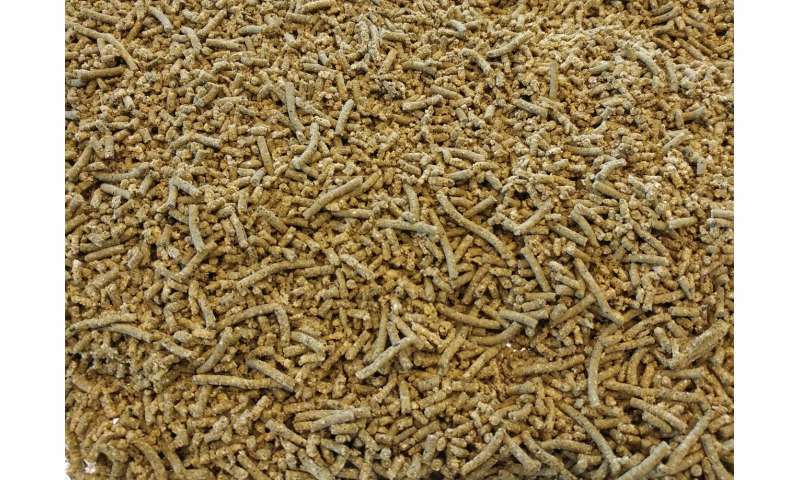 Aquafeeds also draw on large amounts of soy and corn from industrial farms, which pose other environmental concerns due to the use of fertilizers and potential runoff into rivers, lakes and coastal waters. In addition, aquafeeds may trigger nutrient pollution in aquaculture effluent, as fish are unable to fully digest soy and corn, which are major feed ingredients. The Dartmouth research team's latest work replaces fishmeal with a marine microalga co-product, Nannochloropsis oculata, which is rich in both protein and omega-3 fatty acids, including eicosapentaenoic acid, that are essential to fish growth and quality. The co-products are left-over algae meal, after the oils have been extracted from commercially-grown algae biomass to manufacture nutraceuticals, chemicals and fuel applications. The co-product is available at commercial scale and continued increases in supply are expected. The study's findings show promise in replacing conventional protein ingredients in tilapia feeds. Close-up of Nannochloropsis oculata, a co-product feed for Nile tilapia aquaculture. Image by Devin S. Fitzgerald. Credit: Devin S. Fitzgerald. "The possibilities for developing a sustainable approach to aquaculture are exciting. Our society has an opportunity to shift aquafeed's reliance on fish-based ingredients to a fish-free product that is based on marine microalgae, and our findings provide new insight into how we can get there," says lead author, Pallab Sarker, a research assistant professor at Dartmouth. The research builds on the team's earlier work developing a marine microalga feed for Nile tilapia made from Schizochytrium sp., which evaluated how the feed affected digestibility and growth. The results demonstrated that Schizochytrium sp. was highly digestible lipid and DHA, an omega 3 fatty acid source for tilapia. The tilapia not only had higher weight gain but better feed conversion compared to those on a control diet containing fish oil, when the Schizochytrium sp fully replaced the fish oil. As part of the team's goal to eliminate aquafeed's reliance on marine fish and terrestrial crop inputs, they are combining Nannochloropsis co-product with other marine microalgae to make aquaculture feeds more sustainable. So, if you want to make things more sustainable... why not just use these microalgae to feed humans directly, as opposed to growing the fish themselves (Which are living creatures that feel pain) and then eating them? "Farm-raised tilapia--one of the most highly consumed fish in the US-- contains several potentially harmful fatty acids, with higher levels of proinflammatory long-chain omega-6 fatty acids than some hamburgers, doughnuts, and even pork bacon, according to a new study . "For individuals who are eating fish as a method to control inflammatory diseases such as heart disease, it is clear from these numbers that tilapia is not a good choice,"
"The study is the first of its kind to evaluate replacing fishmeal with a co-product in feed designed specifically for Nile tilapia." Aquaculture nutritionist at companies like Cargill, Purina and Zeigler have been using algal by-products in experimental fish diets not only for Tilapia sp., but other aquaculture species both marine and freshwater for at least two decades. A quick Google search will reveal a host of papers on the subject and that doesn't cover the proprietary research.